On September 22nd, Kyau and Albert return to AVALON Hollywood for an extraordinary night featuring an open to close set by the German Trance legends. Kyau & Albert have been creating music together for over 20 years. The duo has created chart topping originals like Made Of Sun, Velvet Morning, Walk Down, Kiksu and Are You Fine? Group member Steven Moebius Albert is the male vocalist on all of the duo’s songs, setting Kyau & Albert apart from most artists in the Trance scene. Kyau & Albert are well known for their collection of albums “Here We Are Now” "Worldvibe", "15 Years" and "Nights Awake", and have remixed some of the biggest names in music like Dido, Armin van Buuren, Kosheen and much more. The duo has brought their high energy performance all around the world and has been featured on the DJ Mag Top 100 at the 48th spot. Their most recent release, “Tube Hearts” is the first single to come from the duo in 2018, and encaptures both the nostalgia and new sound direction of Kyau & Albert. In addition to their career as musicians and producers, the DJs are label heads at Euphonics, which has been putting out quality music since 1997. With a busy career on their plate and an impressive background in DJing, their Avalon set will be a must-see. 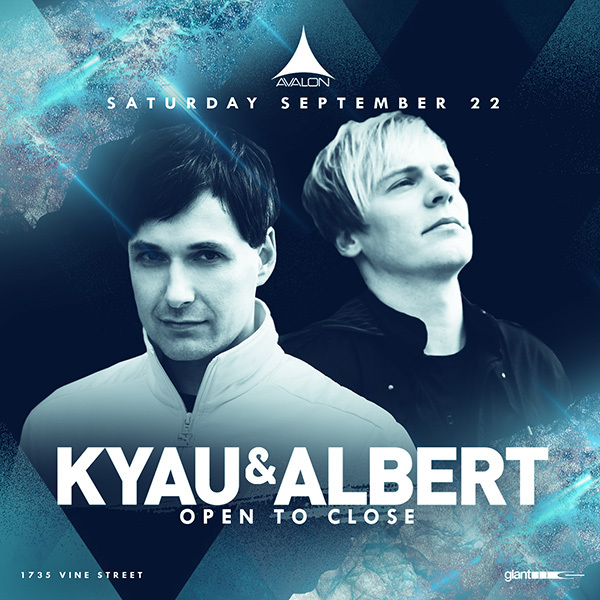 Kyau & Albert will be accompanied by the bringing one of their iconic DJ sets to AVALON Hollywood on September 22nd.